Last time Cousin Pati stopped by, we were talking about buttons. We both have extra buttons lying around. I don’t often use buttons on cards – it makes a card expensive to mail. I did pull out an old Sizzix/Stampin’ Up! Embosslits die – Sweet Buttons, to create paper buttons. 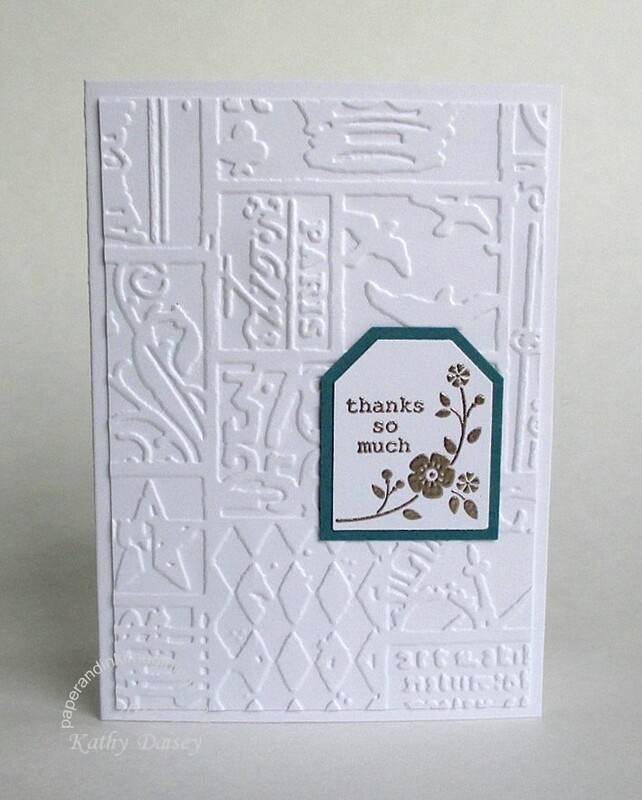 Supplies: Paper – Neenah Classic Crest Solar White, PopTone Razzle Berry, Sour Apple, Stampin’ Up! Basic Black, dies – Reverse Confetti (quilted tag), Stampin’ Up! (buttons), corner rounder – We R Memory Keepers. 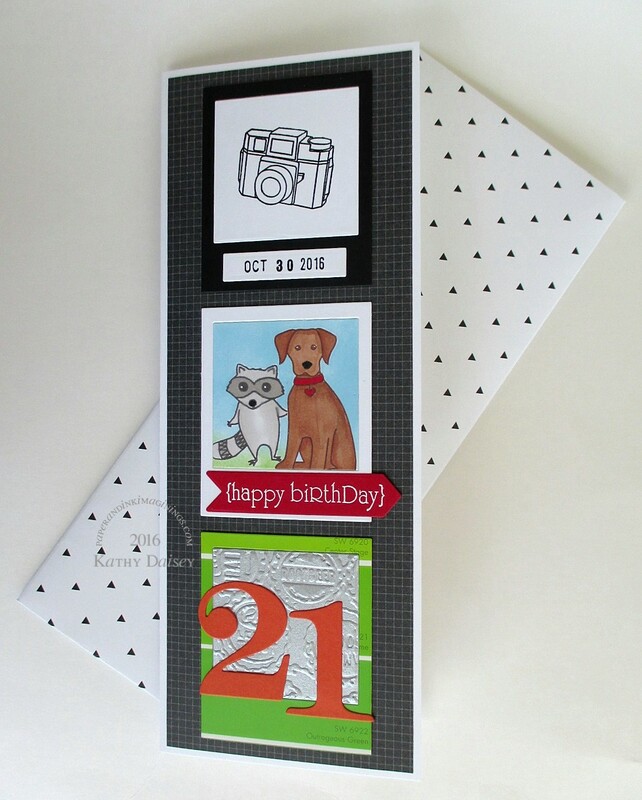 Categories: card, note | Tags: card, Neenah, Poptone, Reverse Confetti, Sizzix, Stampin' Up!, We R Memory Keepers | Permalink. An embossing folder really makes a quick card! Supplies: Stamp – Stampin’ Up!, paper – Neenah Classic Crest Solar White, Stampin’ Up! Night of Navy, Tempting Turquoise (retired), ink – VersaFine Clair Midnight, dies – Lawn Fawn, embossing folder – Tim Holtz/Sizzix, embossing powder – Stampendous Detail clear, silver cord – Paper Mart. 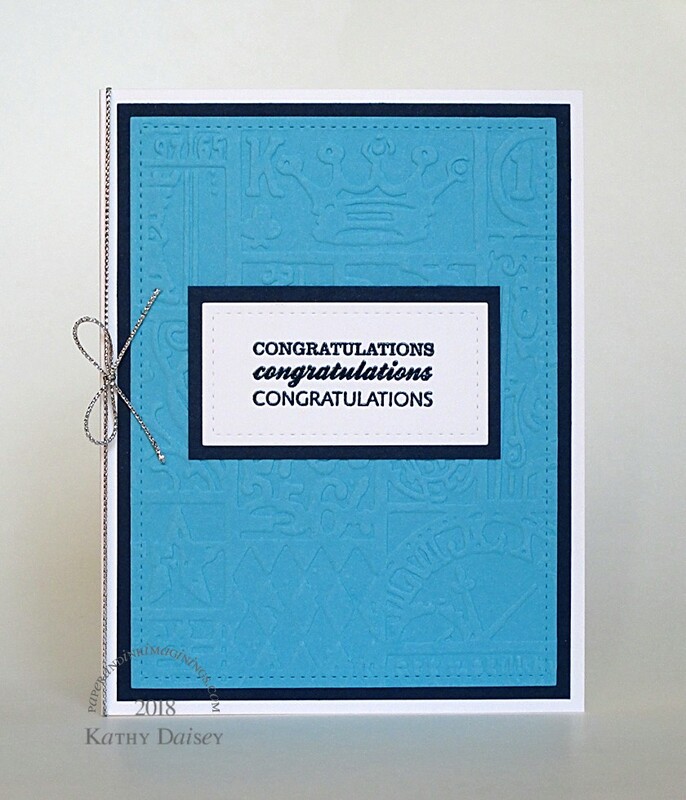 Categories: card, congratulations | Tags: card, Lawn Fawn, Neenah, Paper Mart, Sizzix, Stampendous, Stampin' Up!, Tim Holtz, Tsukineko, VersaFine | Permalink. I was wishing for summer weather and fun sunglasses when I made this! I cut 3 pairs of glasses with the My Favorite Things die (On A Whim, Razzle Berry, Basic Black) and glued them together (leaving one layer off the lenses). I dotted a bit of Wink of Stella into the tiny cutouts on the cat eye corners for some shimmer. Supplies: Stamp – My Favorite Things, paper – American Crafts Amy Tangerine On A Whim, Neenah Classic Crest Solar White, Pop Tone Razzle Berry, Stampin’ Up! Basic Black, Pool Party, ink – VersaFine Onyx Black, ZIG Wink of Stella clear, die – My Favorite Things, embossing folder Stampin’ Up! (Sizzix). 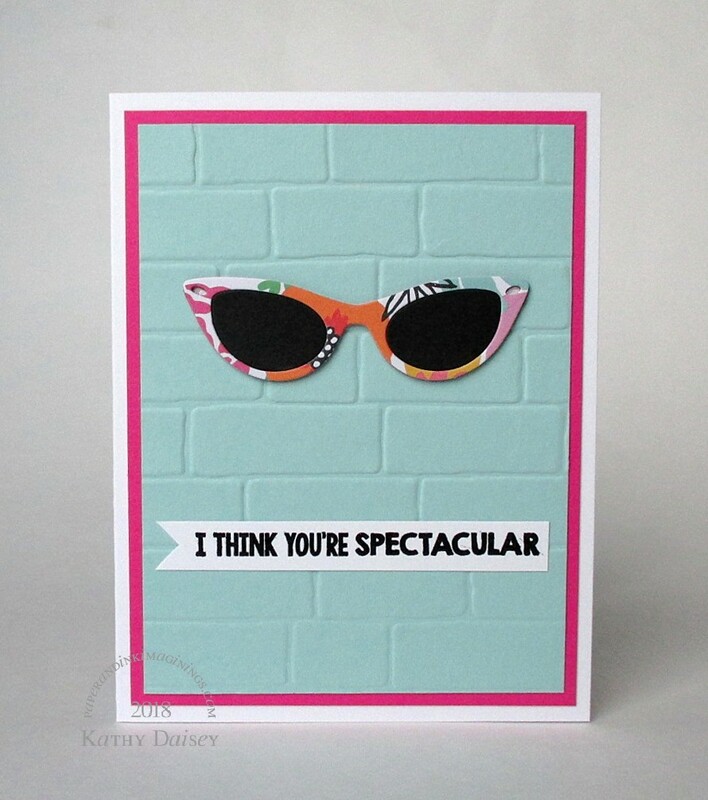 Categories: card, encouragement, I love you | Tags: American Crafts, Amy Tangerine, card, My Favorite Things, Neenah, On A Whim, Poptone, Ranger, Sizzix, Stampin' Up!, Tsukineko, VersaFine, Wink of Stella, ZIG | Permalink. This is the card I made for Offspring2 recently. I cannot believe 21 years have passed! Supplies: Stamps – Hampton Arts, Hero Arts, OffiStamp, Papertrey Ink, Taylored Expressions, paper – Lowes paint chip, Neenah Classic Crest Solar White, Stampin’ Up! Basic Black, Kaleidoscope DSP (card & envelope), Real Red, Tangerine Tango, inks – Copic 110, E15, E23, R29, W1, W3, Papertrey Ink Fresh Snow, Tim Holtz/Ranger Distress Inks Mowed Lawn, Tumbled Glass, VersaFine Onyx Black, dies – Papertrey Ink (numbers), Spellbinders (rectangle tag), Taylored Expressions (banner, photo), embossing folder – Tim Holtz/Sizzix, embossing powder – Filigree Fine Art Powder clear. Categories: birthday, card | Tags: card, Copics, Hampton Arts, Hero Arts, Neenah, OffiStamp, Papertrey Ink, Sizzix, Spellbinders, Stampin' Up!, Taylored Expressions, Tim Holtz, Tsukineko, VersaFine | Permalink. Supplies: Stamp – Stampin’ Up!, paper – Papertrey Ink White, Stampin’ Up! Blue Bayou (retired), ink – VersaFine Smoky Gray, tag punches – Stampin’ Up!, embossing folder – Tim Holtz/Sizzix, embossing powder – Ranger Liquid Platinum. Categories: card, thanks | Tags: card, Papertrey Ink, Ranger, Sizzix, Stampin' Up!, Tim Holtz | Permalink.